Remember the young school girl in Warri, Delta state, identified as Success, who went viral for her display of annoyance after being sent home from school for not paying her school fees and she explained that she preferred being flogged to going home? 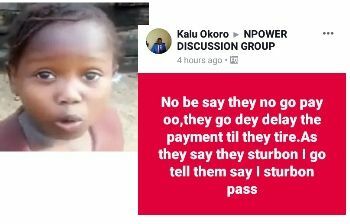 "No be say they no go pay oo‚they go dey delay the payment til they tire.As they say they sturbon I go tell them say I sturbon pass "
This funny statement is generating lots of attraction on Facebook and the poster has been Named N-power Success. However, we want to urge Npower beneficiaries to remain calm as payment of March stipends commences soon. No need to panic! !